Pro-nuclear in Japan: Japan Quits Whaling - Or does it? Reports in Australian media today about the Japanese whaling fleet in the Antartic giving up and heading home. An official of the Japanese Fisheries Agency is quoted as saying "The Nisshin Maru, which has been chased by the Sea Shepherd, has suspended operations since February 10 so as to ensure the safety of the crew". The Nisshin Maru is the main Japanese whaling factory ship, the centre of the fleet. If these reports are true they represent a major victory for conservationists. For Japanese officials to actually admit that Sea Shepherd played a part in making them stop cannot be viewed as anything but a major admission of defeat. The tree-huggers at Sea Shepherd will be having a major party, lentil burgers for everyone. I don't know how this will turn out, but I doubt that Japan would give up whaling so easily. The Japanese government thrives on adversity, and they don't stop doing something just because it is unpopular and doesn't work. On the contrary, ineffectiveness and unpopularity seem to be prerequisites for many government initiatives. Possibly the Japanese government and the JFA will revise their whaling policy in the face of unfavourable reality. But I would be surprised. I don't think Japan should continue whaling, but not because the whales they hunt are endangered (they're not) or especially intelligent (they're not) or killed cruelly (they're not, or at least not more cruelly than other animals). Japan should discontinue whaling for different reasons. It's unnecessary, as Japanese rarely eat meat, and whale meat is just being stockpiled in warehouses. It's also unpopular overseas, and Japan, which has enough troubles in international diplomacy, shouldn't make enemies when it has no need to. In addition, whaling loses money. It's an expensive business and nobody is really interested in eating the stuff. Finally, this "cetacean research" excuse reflects very poorly upon the Japanese. Nobody likes a hypocrite. 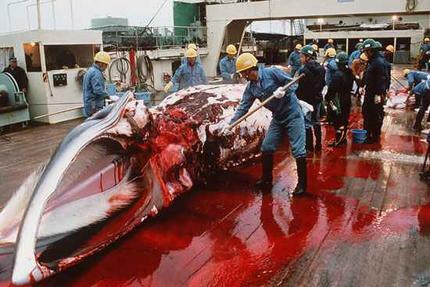 Some Japanese argue that Japan has a tradition and history of whaling. Well, so does Australia, so does the U.S. The U.S. also has a history of slavery, and nobody is suggesting they bring that back. I am in the US and I think we should bring back slavery.